Use the tool below to email or video message your lawmaker. At Countable, we primarily focus on Congressional legislation and provide easy ways for constituents to make their voices heard. There are times, however, when you may want to contact your lawmakers about more general issues. The tool above provides a quick, easy, and impactful way to do so. Countable makes it quick and easy to understand the laws Congress is considering. We also streamline the process of contacting your lawmaker, so you can tell them how you want them to vote on bills under consideration. – Read clear and succinct summaries of upcoming and active legislation. 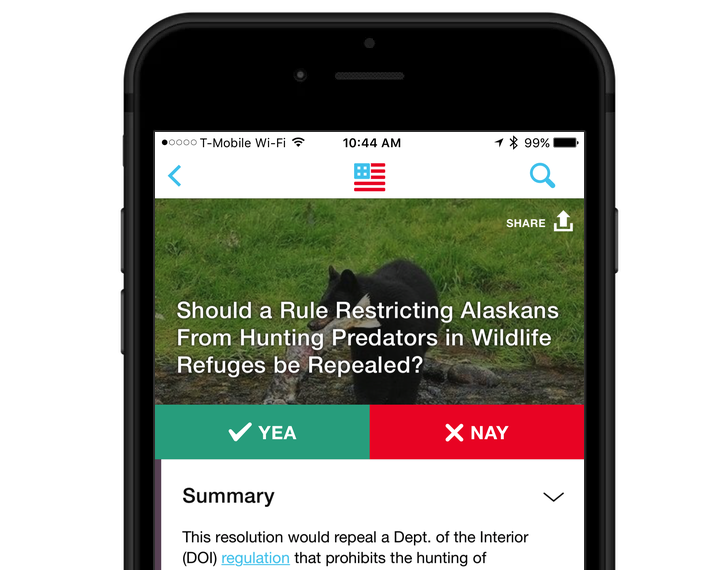 – Directly tell your lawmakers how to vote on those bills by clicking “Yea” or “Nay”. – Follow up on how your elected officials voted on bills, so you can hold them accountable in the next election cycle. Download the app for free on iOS or Android devices. How can I request my own page like this? Do you run an organization and are looking to get your audience more engaged? Request a free, branded page like this and turn your supporters in to advocates! Get non-partisan breakdowns of major legislation and easily contact your elected officials - all from a free app for iOS and Android.